Stable and reliable production processes are the fundamental basis for high customer loyalty, productivity, quality and delivery reliability. Previously elaborated standards (operating, organisational, work or process instructions) must be regularly checked and their compliance internalised at all levels of the company. 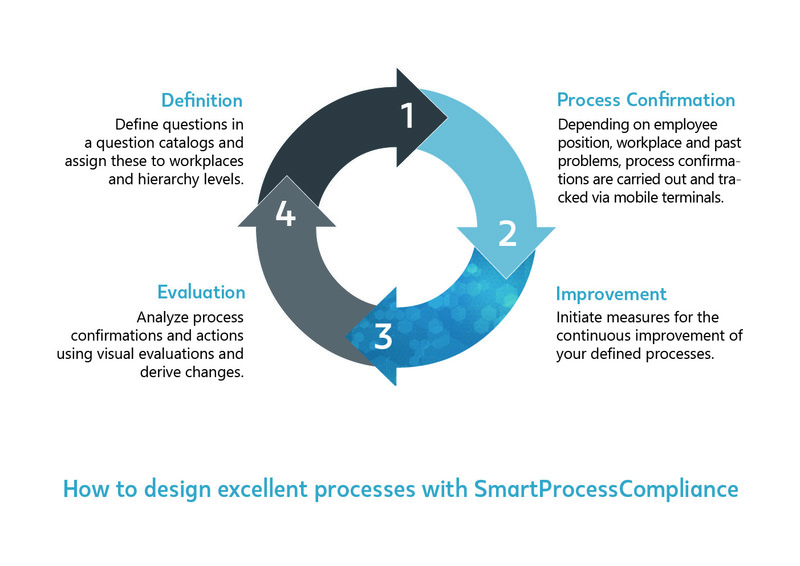 With SmartProcessCompliance, you integrate your entire workforce into the continuous improvement process and into the adherence to operating instructions directly at the processes, and thus receive a broad identification with the company goals of quality improvement, risk minimization and customer loyalty. Using SmartProcessCompliance, a modern software solution consisting of a web portal and a mobile app, your employees will easily learn how to follow operational instructions, without enforcement. This will establish a general improvement within your enterprise. Lengthy, costly and boring audit processes are a thing of the past.The necessary questionnaires, process definitions and basic configurations are prepared by the responsible employees and can be managed via WebPortal und Grundkonfigurationen werden von den verantwortlichen Mitarbeitern vorbereitet, und können über ein WebPortal independently. This way, employees can fill out the already configurated process confirmations via the mobile app at all times. These run dynamically, autonomous and intelligently, to automatically reduce quality defects significantly. Independet control of the degree of fulfillment and the possibility to keep track of all measurements support a continuous improvement, to achieve a maximum of engagement in every employee and to support an autonomous independet way of working. A central repository as a base of knowledge for all employees on enterprise organization.